Once upon a time we thought this project would take us 3 months, no longer, and we would be on the road. Kind friends guesstimated 9 months, ‘what! Are you kidding!’ I cried in alarm. Time proved us all wrong and two years later we are still here. I can’t imagine this boat of a bus being finished at any stage, but looking back It would be safe to assume that we are over the half-way mark at least and while we have no immediate plans to leave this town which we are quite happily making a home in, it could yet happen…or we could at least be living in the bus while parked on some land, which is also a long term dream. This building project has taught me a lot. Most importantly to let go of life a little. Ambition is a very temporal thing and the process of becoming is much more fun than the bore of achieving. Here’s where we are up to so far. Some very kind and supportive and encouraging friends were up on the weekend (for the third time), helping us build. Doctor Carl (his actual title) will be deserving of a keg of the finest whisky when we finally celebrate the end of this bus-build! …that is going to be one hellavu party!!! 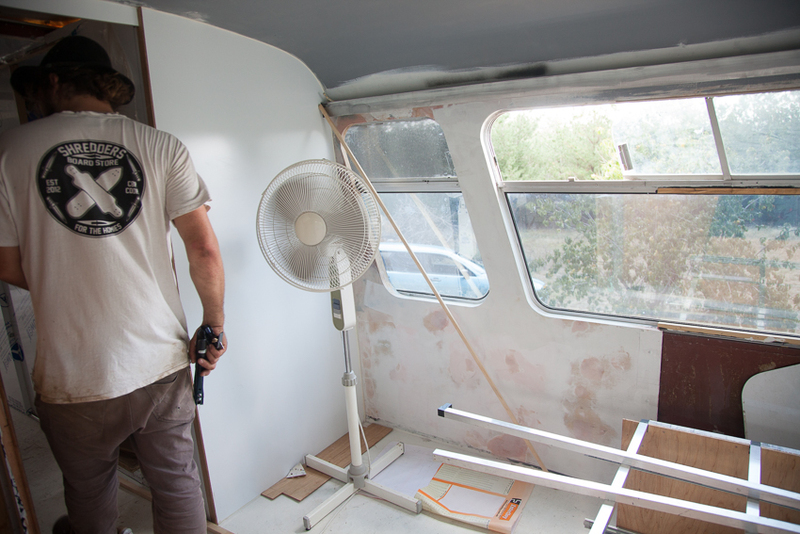 We stripped the apricot paint off the outside and the roof, painted the roof with a thermoshield paint for insulation (insulation has been a big consideration all round on this bus!) and matched the rest of the exterior with a similar colour. You can see the edges of our four solar panels on the front half of the roof….here are a couple of before pictures. This front area is still totally unfurnished. Still, there has been a lot done here. We stripped the interior, took off the old wall panels, pulled up the floor which has now been sanded and painted three times. 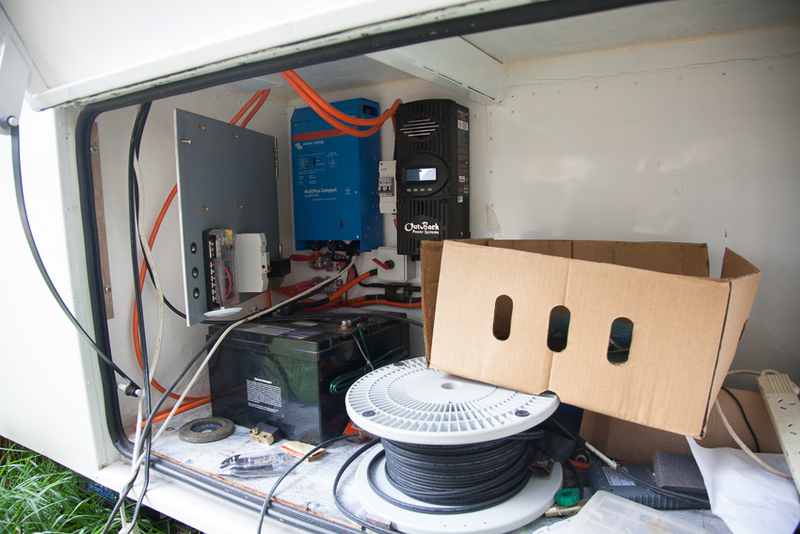 Then we insulated (after removing old, itchy pink batts) and installed power cables under the roof panels. The walls are now clad with ‘Aluwell’ which is aluminium bonded to plastic, making it fairly flexible and also extremely durable. They are matt white walls, it’s hard to see it now in all it’s glory, but the walls are waiting to be unveiled under the plastic. We’ve kept as much window space as possible, but have had to build the walls up part of the way to make room for our kitchen benchtops. The red area at the back will become our pantry cupboard and also space for a water heater and plumbing into the shower. All the walls you see were put in ourselves. Here’s a before pic from the day we bought the beast. We took out everything you see in this pic! The decaying and terribly itchy, yellow acrylic carpet on the roof, every single wall panel, the white ceiling, the lights, the grills, the walls, all the cupboards, the passenger seat, the table. We stripped it right back to an empty shell. The boys moved the stove into the bus on the weekend. Starting to feel more like a home! 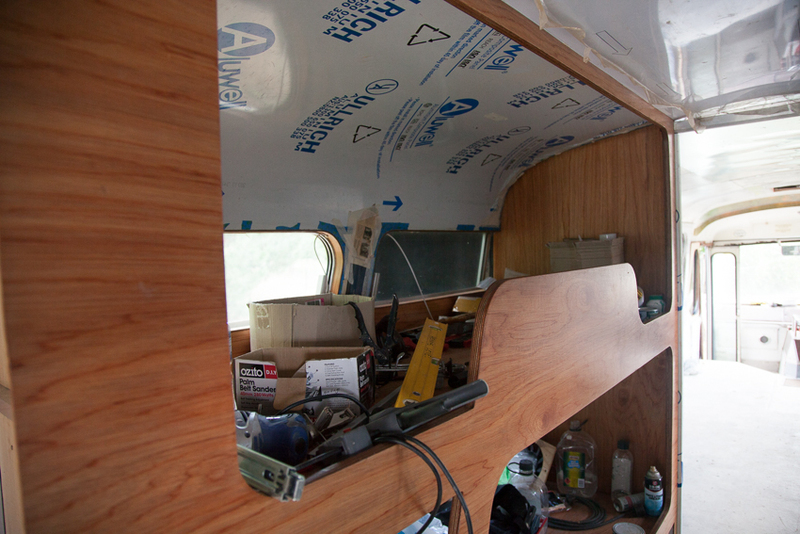 You can see here how we’ve built the wall up so that the bench is not sitting right up against the window, however, so that we didn’t lose that little bit of window above the bench, Henry custom made a panel which slides up out of that wall and covers the top window section. Like I said…bespoke everything! This is the cupboard in our bedroom, which they started on this weekend. In another moment of designing genius Henry constructed part of the cupboard under the kids bed which will hold shoes etc. The rail for hanging clothes (currently sitting on the floor) sits just under the aluminum tube about halfway up the cupboard and there will be shelving above. This is our bedroom. Another thing which looks minor, but was major, is that back opening window. Initially this window was fixed, but we realised that in such a small space there really needed to be a way for the breeze to come through and so Henry designed and made this window you see here, using the same panel of glass but building the sill so that it was waterproof and also fit the newly clad window. These small things take the longest of time, but will be so necessary for when we are actually living in the thing. Not if…when! Also, you can’t see the ceiling here, but Henry took a very, very long time, panelling, bogging and sanding the ceiling so that it is actually seamless and ultra smooth. 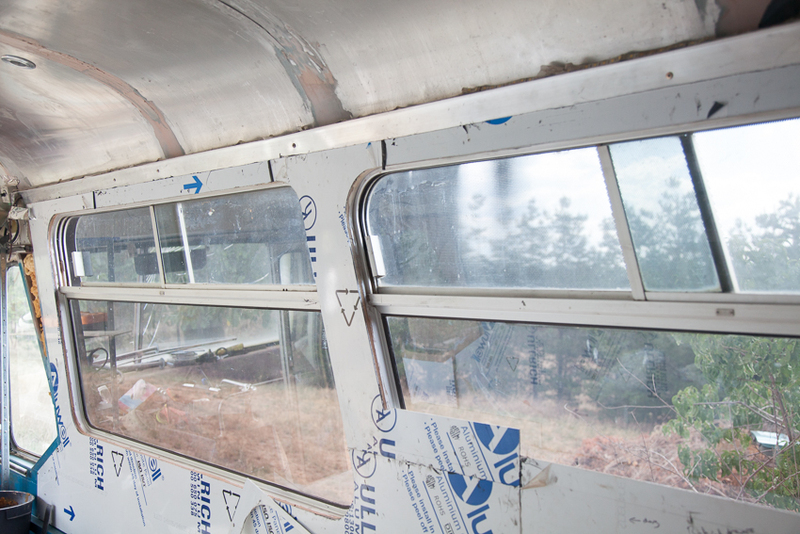 Many bus-homes keep the rivets or attach lights to the roof, but we wanted a seamless, vast feeling roof, as in actual fact it is really quite low. The aluminum frame is the box for the drawers which will hold our clothes, the drawers are push to open, which means no handles to catch yourself on. These have all been made, but not installed yet. Bedhead and bed base are yet to come. The base will sit on the drawers and on top of the step you can see behind the drawers. Henry is making this room modular so that it can be turned into a man-cave once we’ve finished traveling. We will actually have quite a bit of floor space in this bedroom, enough for me to do yoga! All the doors (all three: bedroom, bathroom and the little corridor) all have sliding doors which push to latch and push to open and hide inside the walls which are as thin as we could possibly make them by using aluminum framing and ‘Aluwell’. Below is the other corner of our room, opposite to the cupboard corner, and a spare wall! This kind of thing is a miracle to find in a bus-home and it’s only because of Henry’s excellent design that we managed to do it! This next picture is from our bedroom looking out to the back of the bus. Between the large living/kitchen area and our bedroom is a bunk for the kids and a bathroom. Here’s the top bunk, again, thanks to Dr Carl for helping us with this one! We’d never have been able to do it without you!!! I wish you could see the lights on this thing. Strip lighting hides along the top, internal, wooden edge and glows beautiful along the slope of the ceiling. There are no shadows. It will be the perfect reading environment for Soph. 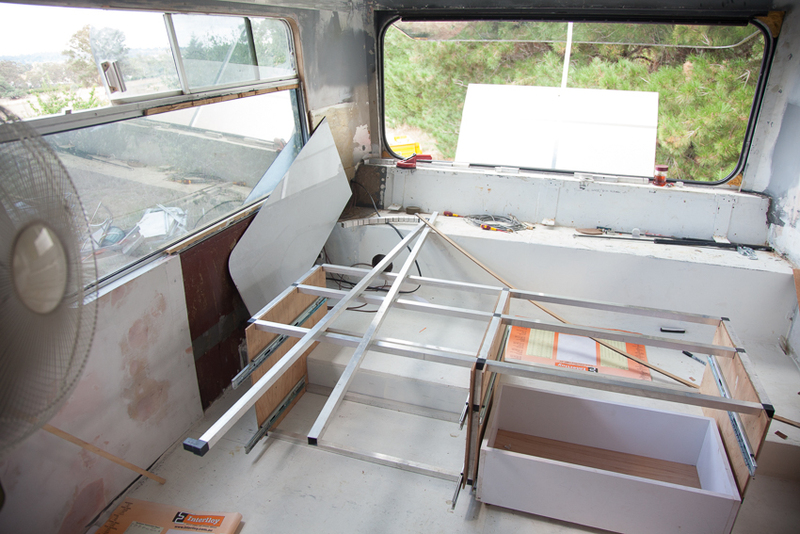 The bottom bunk here, which will be Gunther’s cave. He too has strip lighting along the top, internal edge of his bunk, but it doesn’t quite glow as beautifully as the top bunk. Below the bunks will be covered with a door and baskets for toys and clothes will be under the bed. From our bedroom now, looking in through the bathroom door. The sliding door is not yet attached for this one, but it’s very easily done and all ready to go, so no problems there. You can also see in the top middle section of the picture the corner edge of the hatch which leads up to the roof. We climb up the bunk bed ladder to get up there. The dream is too put a deck up there…but first things first! A confusing photo, perhaps, but this is me standing in our bathroom, reflected in our mirror wall. The room is white with a mirror wall on one side (the toilet and sink side) and a red wall on the other (shower) side. Planning on a composting toilet which is currently half built, but not installed. This red square will have a red back and become our shampoo/conditioner/soap holder. Taps have been installed for the shower. You can see here the Aluminum angle which separates the wall and ceiling. 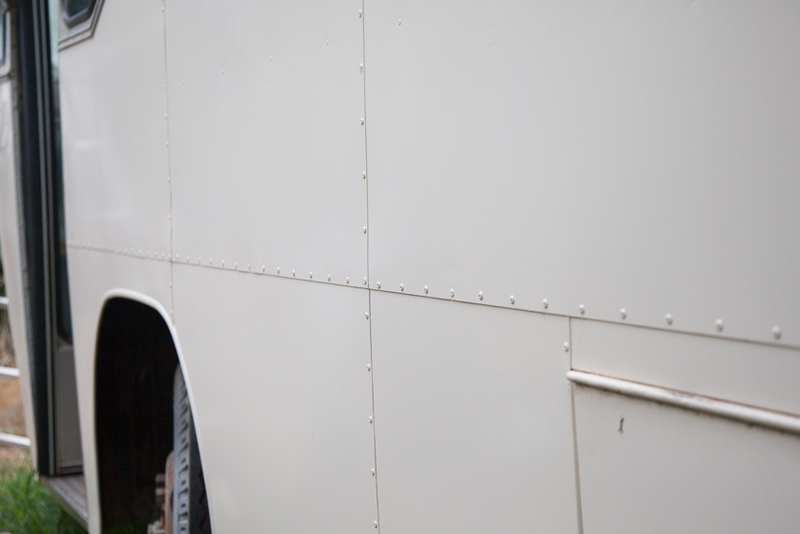 This runs on both sides along the length of the front of the bus (and is also in the main bedroom) and will have LED strip lighting as uplights and downlights, these will be dimmable. Our most recent achievement (and when I say ‘our’ I mean Henry with a little bit of help from me…he is the real brains and brawn behind this. I often just feel like a cheerleader…but apparently I am absolutely crucial in that role! So he says. :)…anyhoo. Solar power. Solar power has long been a dream of ours as environmentally conscious human beings and so installing this on our bus has been a great feeling…now just to get on the thing and use it! Ooookay. So this post has been a long while coming and I guess the only reason why I am putting it down now is that I am seriously procrastinating on my uni studies! I think this is pretty important for me to share. In terms of Our Bus this has been the story of every single little thing. Here’s how it went. Early on in the building process, probably a week after we’d set to building, Henry went out and bought two doors, they were 50mm deep doors, much too high and (it turned out) just a few cms too narrow for our needs on the bus. The idea was that we could saw these down, which we did, only to find that we could actually make the door frames just that fraction wider, meaning these doors were too narrow. In the end Henry was pretty glad about that because it meant he could make his own doors and save 25mm in depth. In a bus every mm counts and if we can squeeze a few of these precious things out of a door or two then that is that. Building the doors turned out to be pretty straightforward. The first was slightly less than perfect and the design was changed. The second was a pretty good rendition of the second design and the third was a perfect turn out of the perfect second design. However, the doors have been in the bus for, oh, well over six months now, and they are actually getting a little marked (not too badly mind you, but it grates on the mind of the maker). Perfection never lasts long it seems. 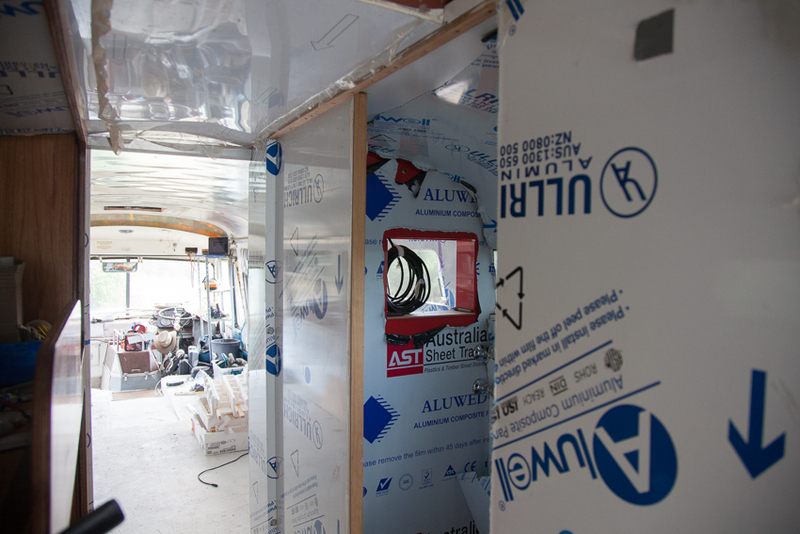 So we managed to recycle the aluminum which had been used in the walls of the previous bus fit-out. We simply glued these in place onto a sheet of the ubiquitous (in this bus!) Alucobond (or Aluwell, which is the brand we are using – it is basically aluminum bonded to a plastic core). We then filled the space with a foam which we had managed to get from our local tip shop. It was most crucial to glue every join and bend – to add strength to these potential weak spots. We have mostly used Sikaflex 252 or 221 or marine grade glue throughout our bus. After scratching up the aluminum and cleaning it with Methylated spirits (and letting it dry – Metho is basically the only thing which can remove this glue), we sikaflexed the aluminum, ready to fold the door over. You can see above where Henry has routed in the grooves in order to bend the door over. We were a little unsure as to how the door would bend and whether it would bend square, but it did like a charm, it was surprisingly easy actually. Henry also cut grooves into the aluminum for the door runner to sit. This was entirely his department and I just had to look impressed once he’d finished…which I did – and I was! Glued over. We left the back end of the door uncovered. There was really no need to cover here. One door used one sheet of Aluwell perfectly and the tail end would be hidden in the wall anyway. Sometimes it’s not worth getting into a tizz about something that will never been seen or noticed at all. And done! How neat is that fold! Installing the doors was another effort, particularly as our bus is sitting on a slope and sort of leaning sideways as well. It is all kinds of not square! I left that, again, to Henry’s genius. He has them now sitting inside our walls, entirely hidden as the mechanism to open is a push-to-lock/push-to-open, all of our doors and drawers use this mechanism – makes sense really. No one wants to be walking into handles, something which is made more likely when squeezing through tight spaces. 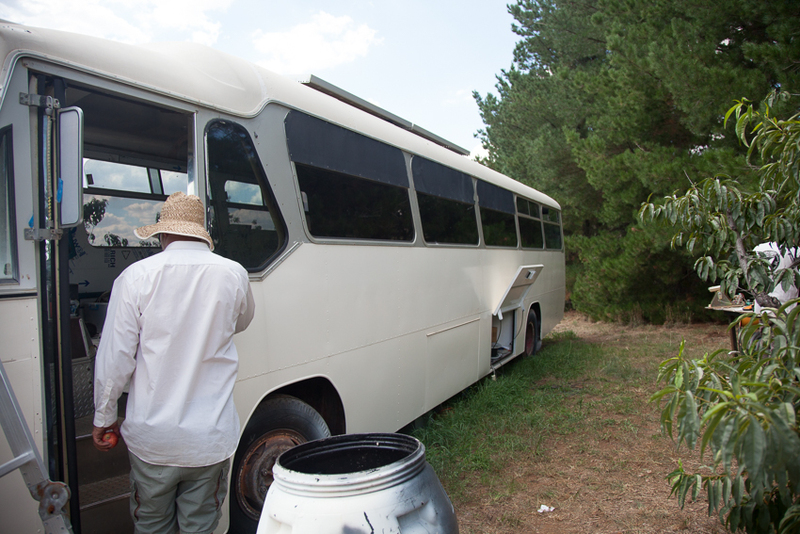 We have been working on getting the bus painted and sealed before Winter sets in, but it seems every time we go to do something we end up completely detoured and working on something else. We knew this side would be a problem and it has been. Henry has had to cut out a lot of the steel frame, which has been bent up and bashed a bit, he will have to weld in some new steel. Meanwhile, while we had the frame ripped out, he decided to refurb the fuel tank and retro fit the grey water tank and so we have been doing that all week. The fuel tank is red for speed…or danger. The grey water tank is not finished yet. It was fitted out beautifully, but then we realised there was no drop between the inlet hole and the shower drain hole…and water doesn’t really flow uphill – according to the laws of physics…or so Henry tells me (not really, I’m not that dumb, promise!). So we will have to redo that. On the homefront (mostly only mornings and nights are spent at ‘home’) it’s funny learning more about your children as they change and grow over the days/months/years. Gunther has learnt that he really likes snuggling and so a few times Soph helps him bring his bed into the living area and he snuggles on the floor. Yes, I know, cute. And Sophia is picking up photography, as no doubt all of her generation will, this was only the second attempt and, sure thing, I am in focus! However she asked me to do it one more time as my hand was ‘in the way’ (she’s already considering composition), but that third attempt – definitely not in focus. I rescued some photos from my phone today. Here they are, all sorts of odd bods. Walking near the oval in Curtin, it is good to see clouds, it’s been so dry here lately. Our messy room (crammed with all our living things and bus things). Soph up a tree. Nothing unusual there. At my mums. Enjoying a cuppa. My dads guitars. He makes them. The Floriade Ferris Wheel. With mum & Nonna & the kids. A Burley Griffin Gig at the Phoenix Bar. Apparently they rocked out the other night and I missed it. A date on my own. Our 6th Anniversary date at Ellacure. Amazing food. A bathing Sophia. Fireworks at the Young Cherry Festival. Dodgem cars at the Young Cherry Festival. Henry on our car on the way to the Coast in December last year. Waiting, waiting for Henry to finish work. I do spend a good deal of time waiting for him. Mine and Sophs local skate joint – the PCYC courts. 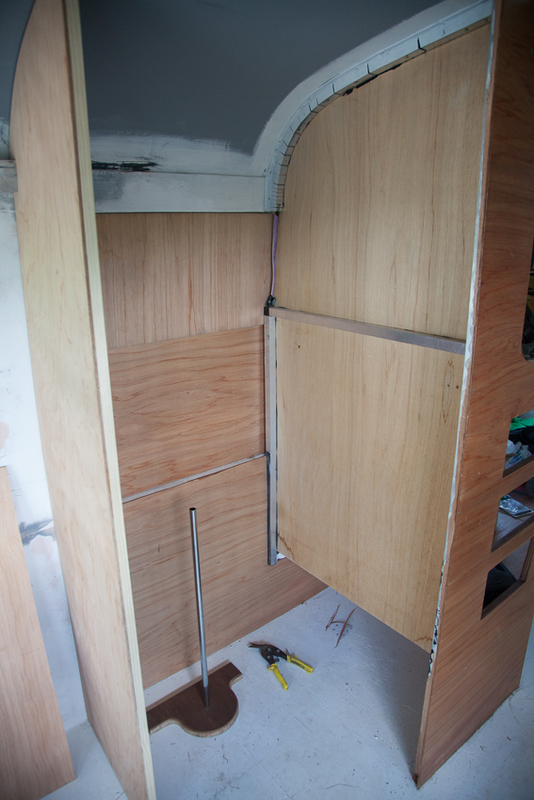 Here are some promised photos of our progress on the bus. You would think that with our wildest child at school we would be charging ahead, but it doesn’t seem to be like that. I suppose it’s like when you’re a new mum and you finally get your kids off to sleep and you can finally sit down and do what you have been wanting to do for ages, but instead you take the chance to do the dishes, hang out the washing, clean the bathroom, sneak in a cup of tea and before you know it your darling baby is up and demanding your attention again. It is sort of like that. I myself am adjusting to the routine, so I must just keep positive and not kick myself too hard and simply accept what I can and can’t do. Still, here’s where we are up to with the bus so far. 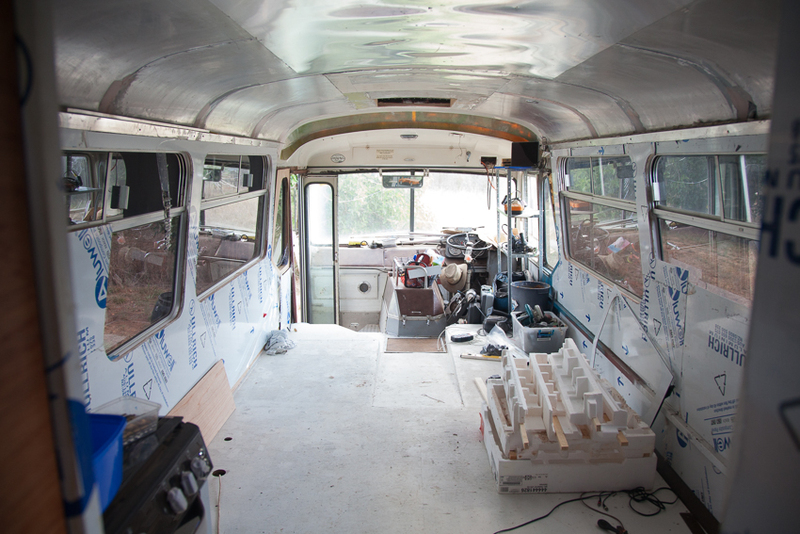 Since these pictures were taken we have been running cables through the roof and attaching the roof panels to the front part of the bus. We’ve cut a new hole in the roof and covered over an old one (making room for solar panels) and we are almost up to putting the curtain pelmets on. 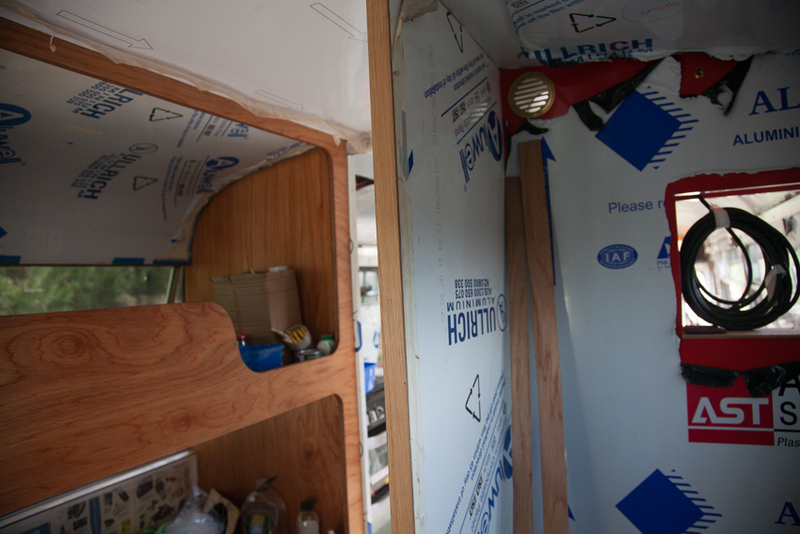 Once these are all on and the roof is affixed and bogged smoothed it will be time to paint our bedroom walls and roof, the kitchen/dining/lounge walls and roof and the outside of the bus – we are hoping to do these all in one hit. First, let me introduce you to our bunks. These are the star of the bus at the moment, one of our few completed pieces (almost – just a few more coats of Estapol and, voila!) Thanks so much to our friend Carl for helping us with this – I don’t think we’d have got so far without the boost he gave us! In a clever moment of design inspiration we have extended the bottom of our cupboard into the hall cupboard to act as a useful shoe storing area. There are a lot of clever little storage solutions like this all over our little bus-home. Here are the beds again in full profile, in front you can see one of the three Aluwell doors which we constructed ourselves (I have phone pics to prove it and might show you when I eventually get them off of my phone). More on this door in a minute. Here is some of the bed detail. I like plywood cross section and so we have used that on our bunk beds. 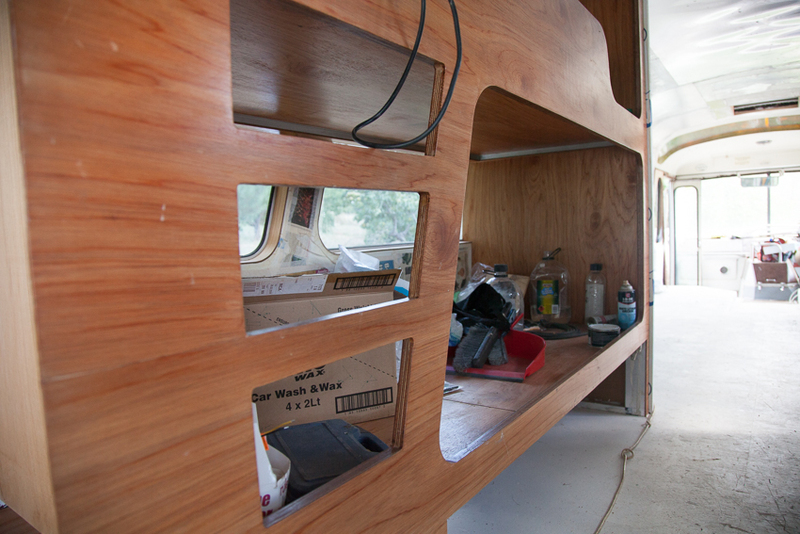 These plywood strips are cleverly concealing the aluminum frame which supports the bed. So, back to the door/s. We needed some kind of catch to hold the door open (for when we are driving, and just because it’s handy). So Henry put to use a latch and a drawer catch on the door. It works a treat. Push to open. And here’s the roof pre-cabling while I was involved in replacing the fairly useless pink batts with foam for insulation. You can also see the back of the shower wall and the long red strip on the RHS is the back of our pantry – yet to be installed. And that window into the shower will be covered up and become our shower shampoo holder. Here is the inside floor of the shower. Shower receptacle/tiny bath on the LHS, small patch of floor in the middle and on the RHS will be our composting toilet. 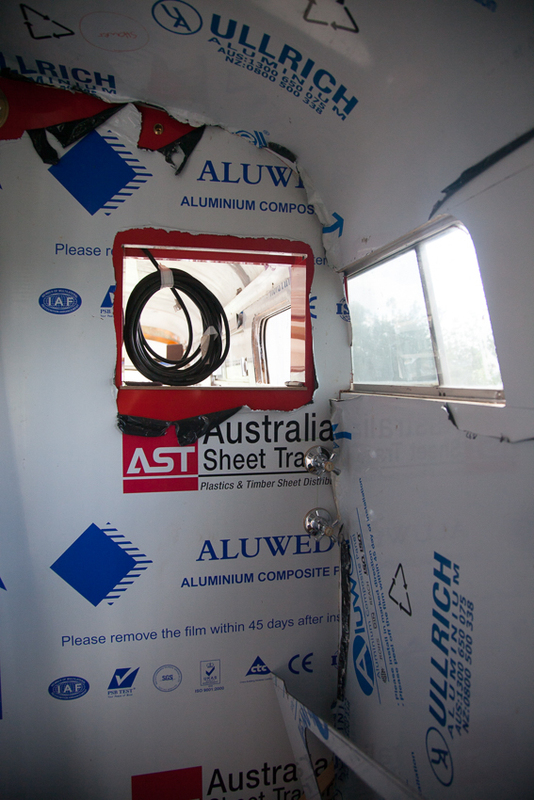 Our bathroom windows – because I like natural light in the bathroom and windows yet to be silled up with ply. That’s a tricky job so we’re stalling on that one. The inside of the red shower wall, still covered for protection. Our bedroom, which has already undergone a few redos and still another to come. Henry was not happy with some of the use of ply and we have discovered a material V-Lite (by the Laminex company) for new drawers and are now using marine ply on the bed as the normal ply warped. The base has not yet been decided on. Here you can see we have taken the back window out. 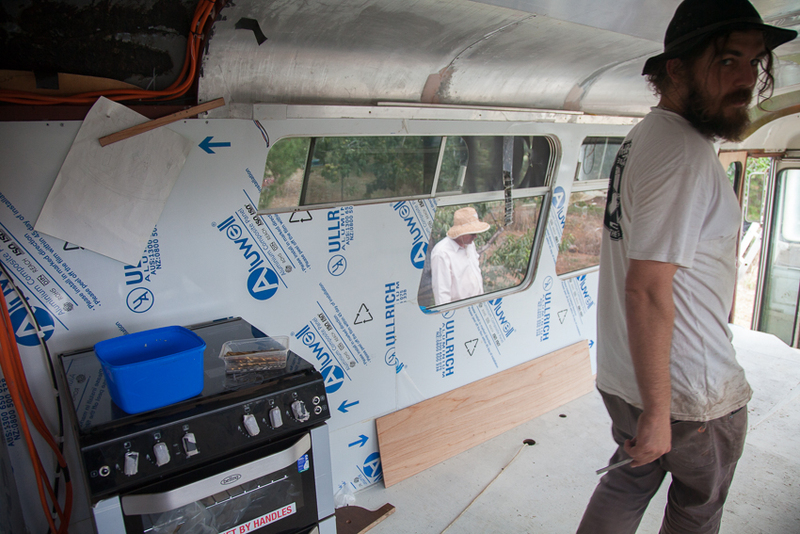 We removed it to replace the seals and then once we experienced the effects of having a draught blow through the bus on some of the stinkiest hot days in the year we just had to make it openable and so Henry is working on that. It’s a good thing he is so handy and so clever. The other side of our room (a wall is now covering that door on the RHS). And a window frame we made ourselves, once bogged and painted you would not even know it’s a fake! Here’s Henrys handy work on the window. Welding, welding, lots of welding to be done. And much thanks to ‘Bobie’ for scratching his name on the window of his old school bus, it will now be appreciated on the windows of our little home. So, these photos are actually a little old – 23rd October to be precise. I’ve been meaning to go out to the bus and take some photos, but the many little jobs to be done and the extreme heat keep getting to me and slowing me down. This should act as a a bit of motivation! So here we see the cage that is our bathroom wall, Henry is squeezing expanding foam into the cavity so that (hopefully) the bus will be as cool as we possibly can make it. He is standing in the shower receptacle and in front of him here is the frame for the shower wall. 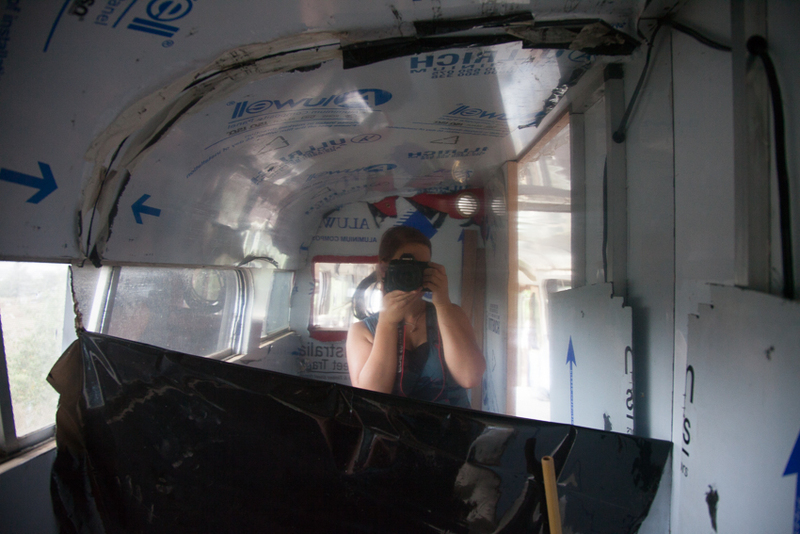 In the middle of the bus you can see the door which we had to build ourselves (we built three of these – from scratch – in total out of Aluminum framing, Alucowell, glue and insulation foam), it has already been hung here, while the walls have not even been built! Gee – I wish you could see it now, though! …. And the wall is now on! Heaps of sikaflex to hold it. This was only the beginning – the roof was made from the same stuff and was a pain to both bend and put into place. And then of course we had the rest of the walls to put in. And here is wall red and behind it you can see wall mirror and only just, just you can see the edge of the roof. It all looks so different now, it’s actually pretty exiting to see these and realise that we actually have come a long way. Bits of the bus are actually starting to look brand, spanking new, slowly it is all coming together! It’s been some time since I’ve shown a bus update. Yes, we are still plugging away at it. The thing is that every day I look around and wonder, ‘What’s changed?’ obviously some things have changed, but it doesn’t translate that well into a photo. We are out here every day doing something. For months it’s been all work and very little sense of progress. The last few days though, that’s all changed. It feels like, huzzah, it is actually coming together! We have a couple of frames (or partial frames up), we have our ceiling in and Henry has been sanding…actually sculpting…the three walls of our room into a perfectly smooth shell. It’s starting to look quite schmick and Henry’s vision is becoming a reality. This little space, above, is where our cupboard is going. Building the framing for this is soon to be done. Here’s the bed, we have actually taken the bed base off for the moment. It needed a slight adjustment and the work which we are currently doing is made way easier without this thing hanging around. The pic above was taken a few weeks ago. Below are photos I took yesterday, and you can see that a couple of the walls are in and the entire roof here has been replaced. Some framing below indicating where one of the bathroom walls will go. We are using 25mm aluminium held together by Qubelock and a whole stack of glue. Mostly Sika Flex as Henry likes to use the best of everything. Oh yes, here’s my handy organiser. I got sick of our bus turning into a junk heap – it slows down the work flow considerably – and so I made an organiser which Henry laughed at, but it has been incredibly useful and worth the scrap of time I spent to literally whip this together. It is not pretty, it is functional. The dust from all the sanding Henry has been doing over the last few days is insidious. Okay, so here’s a frame which I actually made, figured it all out and made it fit all by myself (Henry helped polish it up a bit). An example of Henry’s quest for quality is that, instead of allowing the wall to cut the window in half, he came on the idea of making a smaller window. Part of what he loves about this bus are all the lovely curves, and why not capitalise on them?! Bog. Bog is what is making this bus beautiful. 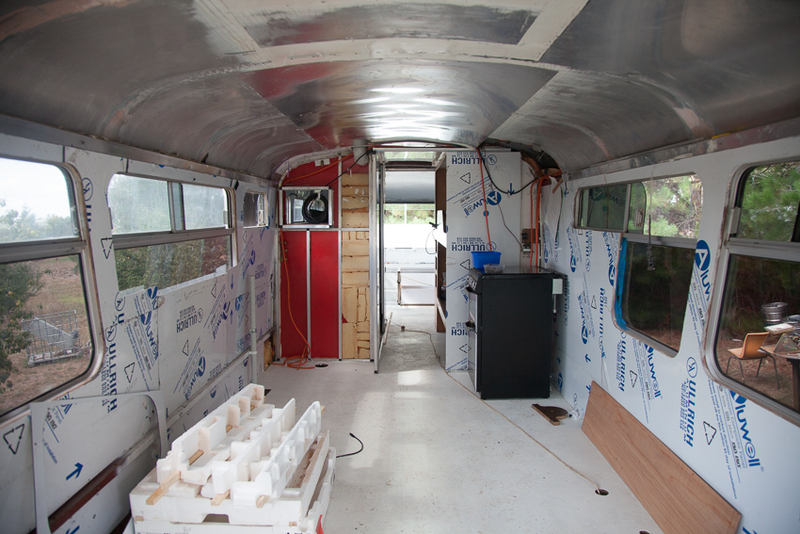 In fact our bus is going to be all Bog, Glue, Aluminium and Alucobond. Not your everyday building materials. We are intent on not having a window sill here. At first we thought about the ‘framing’ (I am not a big fan of framing), but I love the way the light can just flow in without a window sill here. We found a way to make the sill without a window frame. It involves a multi-layer of ply, built up to the wall and a trimmer router to get that edge just perfect (keeping those wonderful curves) and then of course a bit of bog in any holes. And a few more sands and bogs. It looks so great in the flesh and I can’t wait to paint this room white and see it shine! This square metre section (900×1600) is our entire bathroom! You didn’t think you could fit an entire bathroom into that space, did you? Well, Henry is a genius and he has done it. 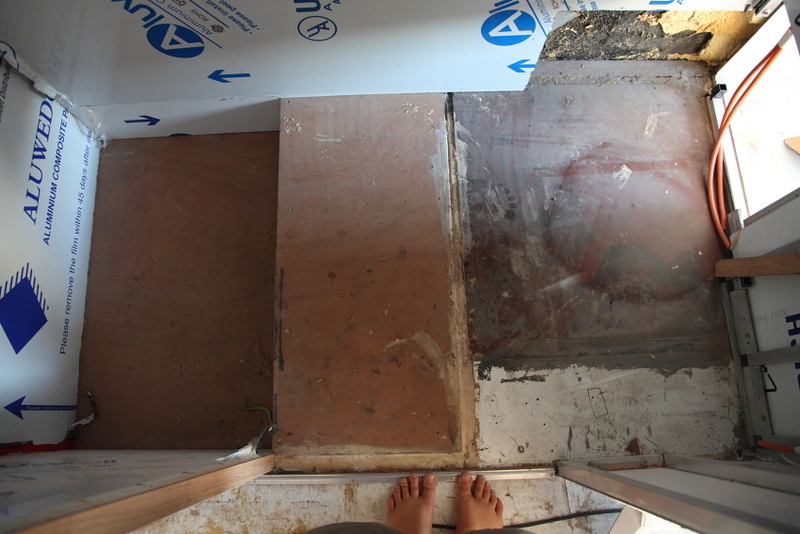 When that floor is completed in copper (yes) it will look…interesting. So, that’s the tour so far. There’s not too much of interest to see so far, but hopefully we will keep the ball rolling and there’ll be a few more updates in the coming weeks. Finally an end to the destruction is in sight and construction is beginning! Well, as I write this there has been (and continues to be) an ongoing struggle with our drawers, involving a bunch of unforgiving, push-to-open, drawer runners. But…we have installed our bed. This involved a 12mm piece of ply for the bedhead, an insert into the window, glued and screwed into place. We built a frame for the top of this piece to hold it all straight and carpeted the inside to keep things nice and soft. The ply will be veneered with rosewood and a rosewood shelf installed on top. I am trying to convince Henry to paint the insides of the drawers in bright turquoise, fuschia, blue and yellow – don’t you think that will look amazing!? He is not sold. Yet. It seems very appropriate that we made this first. It is our bedhead, but it is also Henry’s guitar cabinet. Music is important to Henry and therefore it is important to me and therefore it is important to our family. So, guitar cabinet, item one: check. Henry built a base for our mattress, which is designed to lift up on gas struts so that we can access the storage behind the drawers and under the bed. He is contemplating a shelf in that space which raises with the bed allowing us to simply slide things out. I can’t believe I haven’t yet got a photo of the bed, but that will come once the drawers are in – that will definitely demand a celebratory picture – ’till then you’ll have to wait. We did this work late into a night, when Henry was on a roll and not prepared to stop for sleep, even though it was super cold it was nice to wonder around his dads shed with no kids to worry about. For some reason I just love looking around this shed. I’ve taken photos of it for a past blog and it was one of my more enjoyable photography projects. I love taking photos of interesting objects, object that are usually glossed over and not really seen for the beauty they hold. From the way the grease has collected on a well-worn handle, or the pile of shavings around a vice or the bucket of metal shards and the well ordered sequence of tools and bits and bobs. This stuff fills me with content. There is surety about building things, these big European made machines are made to be of use and it is a privilege to know the person who can use them like an artist. His son also can use them and it is one thing that makes me proud to be that sons wife. This kind of usefulness is somewhat a dying art in the West, it’s presence is a rarity, so I consider myself lucky. We have taken two steps backwards and another forwards. For some reason – we think it might be some latent paint stripper, which somehow made it through the paint prepping stage – the paint in a few areas blistered and came off. But, if there’s anything I’ve learnt from Grand Designs it is that building projects come with inherent setbacks, additional costs and continual time delays. So when I look at our project and am overwhelmed by all the many details that will need starting and completing before we can finally move in and call it home, I remember all those people who have felt the same and broadcast these feelings to the world through this and other such programs. Thanks you people. We’re still here. Hoeing the garden. Feeding the ducks. Chasing cats. Spotlighting possums. Testing our solar hot water. It works. Finding tunes to work by. Another lovely view from our roof. I was doing this. It’s done now! And painted. It looks handsome with a hat. Somehow the ducks live on. Probably because they are inseparable. I love ducks! They ‘quack quack quack’ and wiggle their bottoms into their pen. Cute. Anyone for cheap insulation? We are stuffing the foam from banged up fridge doors and wind surfboards – of all things! – into the walls and filling the gaps with expandafoam. It works. Our grey goose. Top is white and the side is just hanging in there until we get around to it. All in good time my friends. This lifestyle is nice. I was tramping the wheelbarrow past the duck pen through the wet grass and wholeness filled me. If you’ve never tried this kind of lifestyle, don’t knock it. It really is fulfilling. Being involved in nature – that place that is essential to survival, that place from which all our nourishment comes from, air, food, water – is extremely grounding. Hard work of the physical kind eliminates boredom, makes us use our bodies for what they were made for – just to be used! To do things! – reduces depression, stops us thinking about our problems and withdrawing into ourselves. I can’t see anything but good to be gotten out of hard work and caring for the things the people the land the animals all around us. Anyway, it is fulfilling and I am finding it a refreshingly honest way to live. I could see myself tramping around a paddock to feed the ducks, muck out the pigs, grow some crops. It’s fun getting dirty. I’d like to turn some of this lovely soil into food before we hop on our bus and tootle off. 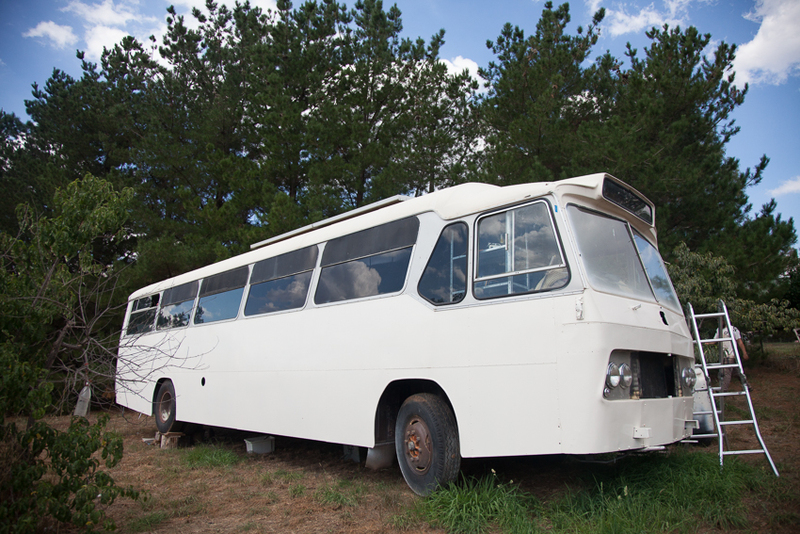 I know so many of you want to know how progress on our bus is going and although we are taking bets on when she will actually be ready, I will have you know: things are coming together and we may yet surprise you all…and ourselves. Here is the children’s playground of choice while Henry and I work. I like having them so near to us while we work and I try to involve them when I can, but when the job involves toxic fumes or power tools then it’s definitely a no-no to even think it. A big job, which took me all of a day to do, was to get into every crevice and vacuum up the accumulated dust of 35 years. It was only slightly rewarding as most things looked the same after the vacuum. This has been a time of firsts, first time angle grinding, first time using a table saw, first time drilling, first time belt sanding, first time using that paint chiselling power tool thingummyjig and first time using a rivet gun. Using the rivet gun was rather fun and I now know how rivets work – never knew that before – I likened it to craft, but the boys did not like that at all. Here below is our fantastic insulation and my(then Henrys takeover) job of riveting a panel BACK ON, no way, we are up to that stage! eee. My main activity over the past week has been bogging, sanding, vacuuming the floor and then rebogging, resanding, revacuuming the floor. But, in the end all those patches turned into one large patch of white. A clean slate. That floor is now ready to build onto. But, be not deceived, this is actual partial progress. Even though this looks worse than it did it is actually better off as it is being improved. Henry’s plans, being sketched out on roof paint, and it did not take him long. In less than a day he designed, drew up and pieced together our decking base. A few days later his mate welded it, and but for a coat of paint on the roof they are ready for installation! Here are the draws to our bed. Just a’waiting. Have you ever seen a country home basement? That is one practical, lived in, full of ‘stuff’ basement. Dear Aunty Glenda had a home day today and she and the kids curled up and got cosy. Oh, the one and only of course! They went on their very own ‘Dora’ explore. Glenda drew up a map which even had the Dora formula of three locations: Home. Creek. Park! It was brilliant. Then I joined them and we all went on this explore together. Mid way I asked: ‘Where do we go next?’ and this is when I discovered this map. ‘Wait a minute,’ said Sophia so matter-of-factly, ‘I will just look at our map.’ And so she did and next we had to go over the creek. Which we did. Then we found the creaky, squeaky park and had a play. The kids have been missing our next-door park which we had in Sutton. We were there every evening during Summer, so it’s a big deal not to have one here. Not that there is any lack of fun to be had around these parts. Finally! We are a proud Solar Owning Family. It actually feels really good to own our very own power generators. It feels amazing. We were the Computer Generation. Our kids are the Renewable Energy Generation! That is absolutely wonderful. Beautiful Big Bedford. It has come in the nick of time, at the perfect time and is exactly what we were looking for. 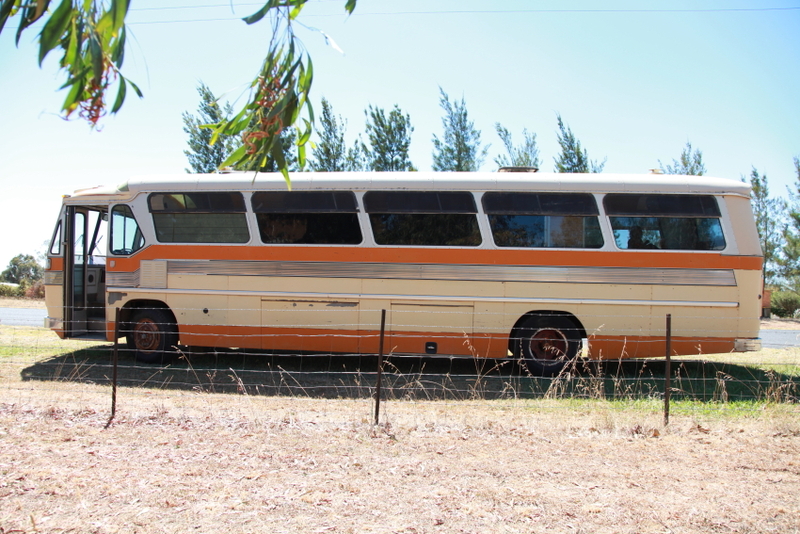 After doing over 3000 kms up and down the south east of Australia (from Taree to Melbourne) in the past week we ended up finding our ideal bus only 15 minutes from Henrys familys place, where we have parked it for all the adjustments we will need to make to get it registered and in running order. In the end we did not compromise on any of the essentials that we wanted which were: Fair price, Bedford, Diesel Engine in good condition, sturdy rust-free body, and minimally fitted out – as we would strip it anyway. We are not kidding ourselves, this is not the end, only the beginning! There is a lot of work to be done, & still lots of research (though we are pretty informed by now! ), finally though, action can be taken. We can begin kitting it out, moving out and moving in. 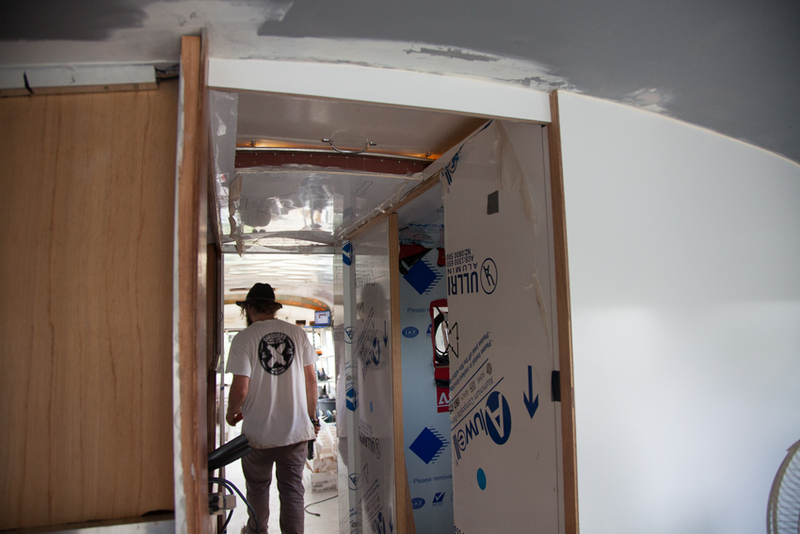 Apart from repainting the exterior we will also strip the entire interior, except for the framing which divides the main bedroom from the bunk & bathroom area and the kitchen and living area – all of that just so happens to be in the exact spots we were planning on putting them – fancy that! We are going for a clean and neutral look with all of the inbuilt furnishings; light wood floors, beige walls. We are thinking textured wallpaper for some feature areas (the curved part of the roof), most of the character will come from rugs within and the adjustable furnishings. Because it is such a small space it is completely necessary to keep things streamlined, light and bright in there. We are looking forward to buying our own stove and cooktop, LED Lights, solar panels, installing our own plumbing including a composting toilet and Henry has ideas for a passive solar ‘air conditioner’ he is inventing, and basically being able to alter things to be exactly the way that we want them. What a luxury after six+ years of renting! It’s a lot of fun to be able to do all this debt free within our budget. Though home ownership is sometime in the future for us I am trusting that the time to rustle up the money for that will come. With houses and land so expensive in Australia I feel good about looking outside the box in order to move forward whilst having an adventure at the same time. 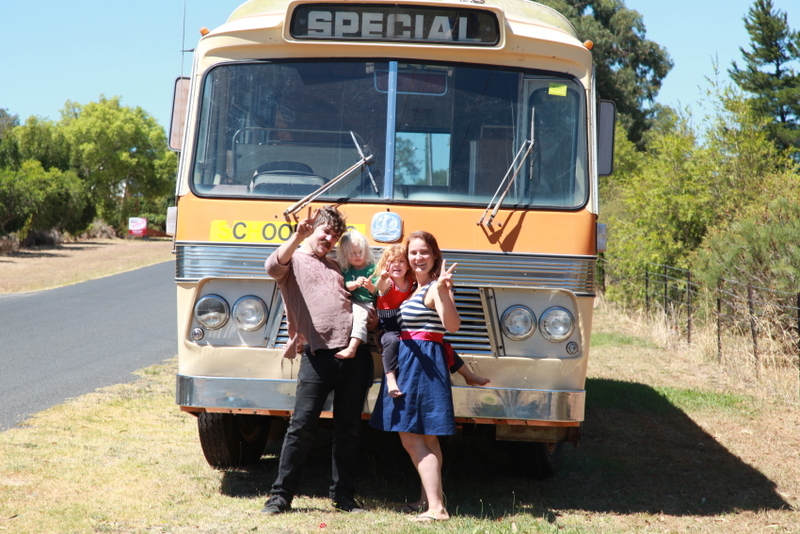 Living in a bus will suit our family down to the ground. I watched my children running and jumping around our bus when we brought it home (‘home’ which is now less about ‘where’ and more about ‘who’), and I thought, ‘this suits my kids perfectly!’, with their wild hair, their boundless energy and inquisitiveness. Sophia shouted ‘Oolevoir’ (Translation: Au revoir) out the window and we really will be saying that in just a few months. But not yet. And not here in this space at least. 1 Comment Have Bus Will Travel!